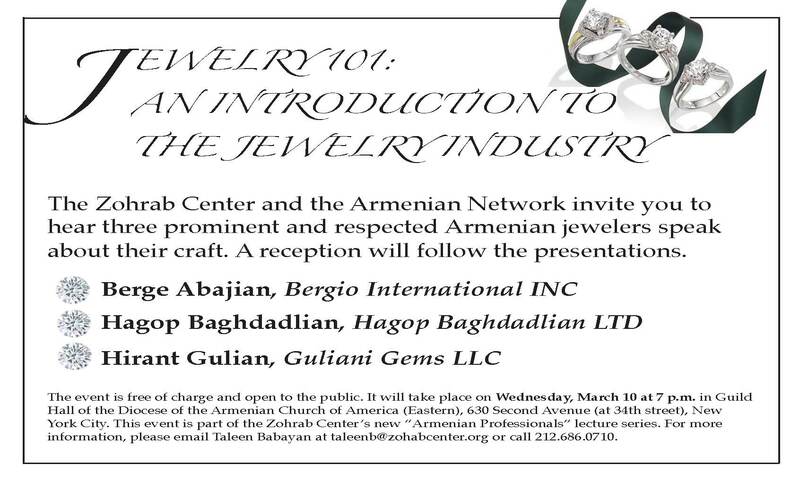 The Zohrab Center and Armenian Network of Greater New York Region invite you to attend a unique event featuring three prominent and respected Armenian jewelers in the metro area– Berge Abajian, Hagop Baghdadlian and Hirant Gulian — who will discuss the jewelry industry and their own experiences in the field. The event will take place on Wednesday, March 10 at 7 pm in G-Hall of the Armenian Diocese, located at 630 Second Avenue (at 34th street) in New York. Wine and cheese reception to follow. This event is part of the Zohrab Center’s new “Armenian Professionals” lecture series. For more information, please email Taleen Babayan at taleenb@zohabcenter.org or call 212.686.0710.